Raffoul Najem was born in Beirut, Lebanon and was saved in 1971 through a Foursquare Church missionary. He is a graduate of Life Bible College, Class of ’74. He immigrated to the United States in 1976 and was ordained by Middle East Gospel Outreach Ministries in 1980 and by Faith Christian Fellowship International in 1994. In 1982, he co-founded Community Christian Fellowship, one church in 8 locations. Rev. Najem is the co-founder and administrator of Community Christian Academy, providing families with a solid Christian education. Rev. Najem also co-founded the Citywide Church of Greater Lowell--a movement of unity and solidarity for churches in the area. As a visionary, he has traveled to the nations proclaiming the good news of the Kingdom of God for the past 40 years. Having an apostolic calling, he is a mentor and a father to pastors and Christian leaders across the globe who seek to transform and influence the world with the message of the Kingdom of God. He moves under the authority and power of the Holy Spirit with a message that is practical, relevant, and life changing. He is the father of three adult children (Jennifer, Laura, and Joshua) and a proud grandfather. 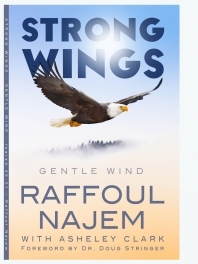 To buy Apostle Najem's book, "Strong Wings" visit his website May you be blessed and changed by what you read!